Blog Favourites: My Tried & Tested Skincare For Dehydrated Skin! So the sun is FINALLY here which is great news right?! Right? Maybe not. Unfortunately all this sun soaking has dehydrated my oily skin to a tight, itchy mess. The funny thing is, I would have NEVER have said I had sensitive skin. Seriously, the amount of chemical product I was layering onto my face through my teens was enough to make me feel like my skin was like leather, impervious to anything. It’s like when people ask if you’re allergic to anything in restaurants and I’m like STOMACH OF STEEL, bring it on! I always thought the same of my skin, until now. Thankfully the beauty fiend in me was keen to trial loaaaadsa of products to find a cure – or at best some relief – and the good news is that YES, I have found some real skin saviours. Beauty products that work? Yes, you’ve heard right. So read on, dear reader. If you’re experiencing similar symptoms, then today’s line up will change your approach to skincare!! The first product I ever tried which made a ‘wow’-noticeable difference on my irritated skin was the La Roche Posay Toleriane Fluid. When I first got it, I was like yeah yeah yeah, no parabens, super sterile, boring. However now, I’ve gone through THREE bottles of it. That’s a lot for a serial product swapper like me!! The Toleriane is housed in an air-free bag which is then bottled with a pump so your cream is never exposed to outside air – the inner hygiene freak in me LOVES this bit!! It’s perfect for storing formulas for longer, and keeping bacteria away. The Toleriane cream itself is completely inoffensive – smooth and relatively ‘normal’ in texture, it really didn’t excite me at all when I put it on. However, the difference it made to my skin was incredible. All itchiness subsided and my skin was back to normal within 24 hours. I have recommended it to sooooo many friends! Even if you only use it on occasional breakouts, the bottle design means you can keep it for a while. If you like your essential oils (read: faaaancy smelling products) and are looking for something a bit ‘nicer’ then this Caudalie Vinosource Moisturising Sorbet is GREAT. Also John Lewis are doing a great free gift when you buy it! Lightweight to apply, it’s more of a gel moisturiser than the Toleriane and it smells really nice. It’s designed for dehydrated, sensitive skin but is lightweight enough that you don’t feel like your pores are swimming in it. It’s also blended with organic grape water to hydrate and soothing chamomile to calm any redness. To keep sensitive breakouts to a minimum, I like to focus on natural, organic skincare and two other great brands that I like are Balance Me and NUXE. The Balance Me range is great – I first experienced it as a freebie in a magazine but since then I’ve been intoduced to the full range via the beauty hall at John Lewis and woweeee, there is a LOT on offer. I love the Restore & Replenish Cream Cleanser – if you like the classic Liz Earle Cleanse & Polish or are looking for something a bit different then this is great. It smells incredible and is packed with anti-ageing ingredients. I was never a fan of cream cleansers because of my oily skin, but they honestly have made SUCH a difference to sorting out the balance of my skin. I also like the Stellar Beauty Balm – which is basically a nicer smelling version of Elizabeth Arden 8 Hour Cream but a balm. It’s got all the multi-purpose benefits of the 8 hour cream, it’s a moisturising balm,a cheek highlighter, hair tamer, insect bite calmer etc – but just a lot lighter and less greasy! Oh yeah, and 100% natural. Finally – for the moments when your skin is feeling really tight but you don’t want to overload it then this NUXE Huile Prodigieuse is not only a well-fancy sounding product, it’s also a GAME CHANGER. I’m not a fan of body oils that don’t absorb but this stuff is a DRY oil. Rub it onto skin and it absorbs quickly and cleanly. BUT WAIT. That’s not eeeeven the best part. The best part is that it sprays on – and not like your usual aerosol spray either. It’s as light as a perfume, you will literally feel like you’re spraying the lightest, most easily absorbed perfume oil onto your legs. So there you go! Some of the products I’ve been reaching for time and time again to help tame my unpredictable skin. When you’ve got sensitive skin, I really feel that using natural and non-aggressive products is the way forward. It’s difficult when you’ve got oily skin and all you do is look for strong acids and strippers (lol, read that again). Sometimes you can’t stand the thought of using placid creams on your face when you want to feel results right? However, acids and strippers as a combination are basically a TERRIBLE IDEA – in all instances..
Changing to a cream cleanser and going for natural-based formulas has done a world of good for my skin. 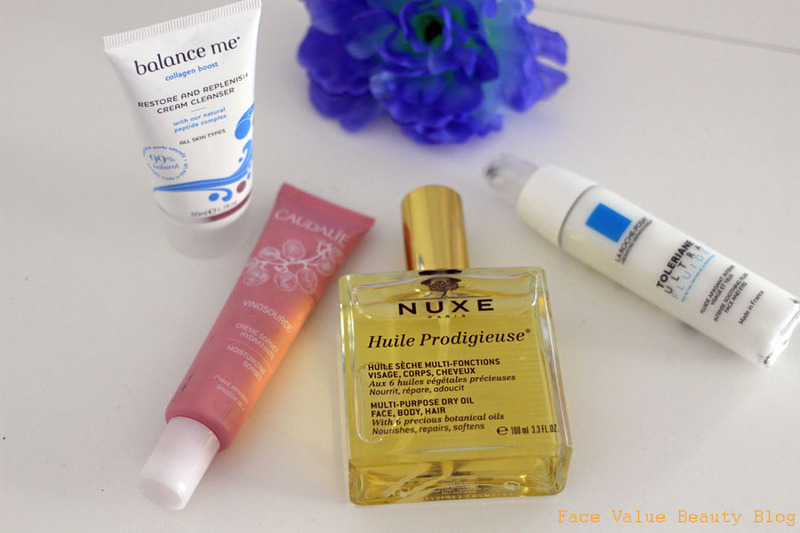 Check out Caudalie, Balance Me, NUXE and La Roche Posay – some of my fave brands that I go to again and again. I love going to the beauty hall in John Lewis Oxford Street because they have testers for almost everything so you can go round and smell, touch and try it all before you buy! You KNOW what I’m talking about. And finally – acceptance is the first stage. Like I said, I was convinced it was just acne and redness but once I accepted it was sensitive skin and started to treat it…. well, the results came from there. SEE YA LATER SENSITIVE SKIN! Thanks to John Lewis for sending me a supply of my favourites so I can maintain this skin! Has your skin changed recently? Do you ever experience sensitive skin? Tweet me your thoughts @FaceValueBlog or send me a comment on Facebook! Extra Winter Protection with Antipodes Hosanna Skin-Pumping Serum!